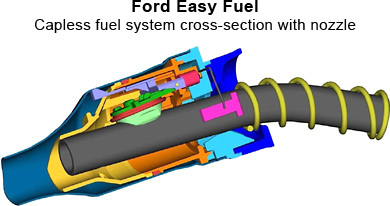 The technology behind Ford Easy Fuel adds extra layers of security behind the external fuel filler opening to inhibit forced entry and syphoning. Easy Fuel’s spring-loaded flap is held closed by two latches that can only be released by a standard-size fuel nozzle. When the proper nozzle is inserted into the filler neck of the system, the latches release and the nozzle pushes the spring-loaded flap to the open position. When the nozzle is removed, the flap is automatically and firmly closed by the spring. Easy Fuel also has a patented inhibitor designed to prevent improper fuelling and syphoning consisting of a fuel nozzle detector that guides the nozzle to the opening. If a nozzle or foreign tube of a different size – a diesel nozzle or plastic hose, for example – is placed in the filler neck of a petrol-powered vehicle, the latches will not release. For a diesel-powered vehicle, the inhibitor will keep out the smaller nozzles. However, Ford in their infinite wisdom neglected to include one with our vehicle, I tried to borrow one from somebody but the diesel one is different to the petrol (makes sense I guess) so off down to the local dealer (Allen Ford) I went! After some "discussion" about how I should have one, had I really looked, sales would need to order one, parts order from Ford Motor Company eventually a salesman saw sense and pulled one out of his draw. So lesson of the day for any Ford drivers out there (or anybody else with a not so easy to fuel system), check you have that crucial piece of plastic just in case you ever need it!